Fog Special Effects | Mee Industries, Inc.
We are certain that our fog system solutions will far exceed your expectations. 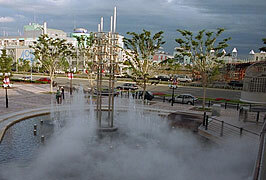 MeeFog systems offer artists and designers innovative and robust aesthetic possibilities to create living pure water fog effects with an entirely assorted design palette. 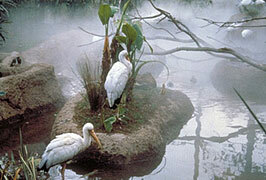 Fog can be used as a medium to modify the visual and tactile aspects of the ambient environment. MeeFog adds dimension and impact to a design and it can be used to highlight other design elements. Nature is full of examples of sensational fog and cloud effects. For instance: light and wispy strands of morning mist on a calm lake, swirls and eddies of mystical low-lying ground fog, huge cumulus clouds building and rolling over a darkened prairie, thin fleecy streaks of high altitude cirrus clouds glowing pink in the afternoon sun, and thick and mysterious clumps of dense fog clinging to a rocky coast. All of these moods and so much more can be created with MeeFog. 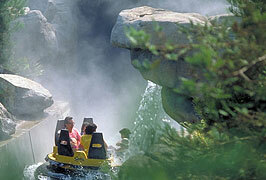 MeeFog is ideal for rainforest and fog theming attraction. Our systems can be used for dynamic fog enhanced entries and walkways. We can even create exciting visual rain effects. 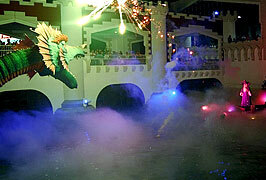 No wonder themed restaurant chains choose MeeFog for their attractions! 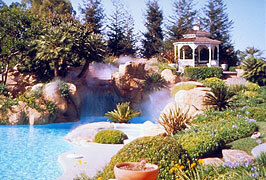 Looking to add sensational fog or cloud visuals to a pool or fountain feature? Rely on MeeFog to happily blend elegance and simplicity with living, moving, pure water effects that accentuate your design elements. MeeFog has over 45 years of experience with designing fog effects for landscape enhancement and fog cooling makes the area useful even on hot days. For beautiful effects all you need is a MeeFog system and your imagination.